In addition to presenting my own class (Power to the Parcel), I also had the opportunity to assist 2 sessions of a titleblock lab, and another on dynamic blocks. During the titleblock lab I helped out with one user asked how the presenter centered his text inside his titleblock field so quickly and easily. The solution rested solely with the Mid Between 2 Points OSNAP. 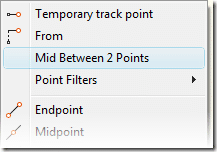 Ctrl + Right Click to get the OSNAP menu, selecting the Mid Between 2 Points option. You can also type MTP or M2P at the command line. Presto! Just like that you just centered text without drawing a single construction line. Titleblocks are just one example of how to use this OSNAP. So go, be creative, and see what other ways you can discover to use this hidden gem. how do we get the “Mid between 2 points osnap”? it’s not on the 2009 osnap menu. It says it’s an unknown command. Darren, the question is: “Is m2p available in LT?” When was it inplemented (version year).